Last month I started a ten part series of retrospective posts, reviewing where I’ve been and how my perspective has significantly changed what I’ll be doing from now on. The first post, on 2007, was when I was diagnosed as nearly dead and got better; this is 2008. I’d started my old blog at Thanksgiving 2007. Two months later, in January, my life took a sharp turn when I discovered e-patients. Here’s how the year unfolded. In hindsight this is amazing, but my tenth blog post ever was about the announcement of Google Health: What’s next, Google Health?? I said it’d be a cold day in hell when I’d trust Google with my health data. 13 months later that would change radically, which would change my life. The day before that, on January 23 Dr. Sands had emailed to introduce me to his friends in the e-patient community. They were the friends and followers of “Doc Tom” Ferguson, the internet visionary who had died in 2006 before finishing a manifesto funded by the Robert Wood Johnson Foundation: e-Patients: How they can help us heal healthcare. For years Tom had invited those friends to an annual get-together in Texas, and this year they invited me to join them. In the year after his death the friends had completed the document, and now Danny suggested I read it – and come join them. That summer my longtime friend George Alexander sent me this book, by a Silicon Valley hotshot trying to figure out why cures don’t explode with innovation the way high tech does. 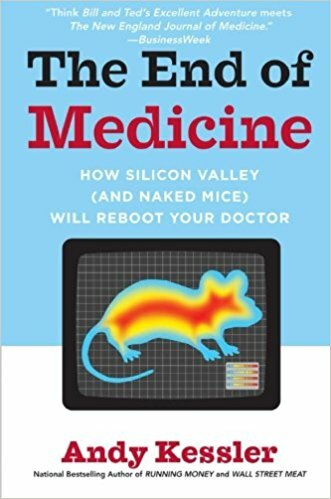 I thought the title was insane – the end of medicine?? Who the heck is going to put my oncologist out of business?? Example: statins reduce some problems 35%, but it turns out that’s a reduction from 1.5% to 1%! Only 1/2% of users get any benefit! For this we spend billions a year on that drug? This was my first hint that the numbers we hear in medical news can be overhyped as badly as any other industry. At the time I shrugged it off as odd, because I still had complete faith in the industry that had saved me. But today I know this is a real problem – here’s my latest post on it. In the Fall something odd and fun happened: my primary physician Dr. Danny Sands got us invited to present my cancer story at the new Connected Health conference at Harvard Medical School. We presented it to a nearly empty room with only 20 people, but I also got my first exposure to a medical conference, and really felt the pull. One man in our small audience was Peter Waegemann, who invited us to come present it again at his “TEPR” conference the next February in Palm Springs. That turned out to be fateful, as you’ll see in the next post. Note: in 2016 (eight years later) Connected Health got bought by HIMSS, the giant health IT system organization. A few months later (2017), so did Health 2.0. I don’t remember where I heard about this book, but it was so remarkable and had such an impact that I blogged my way through it as I read it. Here’s part 1 on my old blog; each one links to the next. Also in the audience at Connected Health was John Logan of the Irish business development office in Boston. In October they had a dinner evening, where he asked me to give a short version of my story. There I also got to meet Phil Longman (Wikipedia), author of this book. Longman’s wife’s final illness had been a tragic mix of screw-ups in private hospitals (e.g. x-rays and records that simply disappeared). After she died he committed to go find “the Jack Welch of healthcare,” some super-executive who was producing remarkable metrics in hospitals that were competent. To his surprise he didn’t find it in private healthcare (profit or non), he found it in the VA: according to sixty peer-reviewed papers., they were a better health system than private hospitals. This was before Obama was elected, never mind before Obamacare became a controversial thing. The VA has been a political hot potato in recent years, and they have screwed up, but as I’ve since learned, there are few truly safe and reliably, conscientiously competent hospitals in the US – the big difference is that the VA gets a ton of spotlight on it. Imagine trying to do all of what the VA does while also spending a lot of management time being a political football. Healthcare and medical science are very, very, very complicated. A lot of good things can be very true, while a lot of other things can be very, very screwed up to the point where people die because of the screw-ups. The good being true doesn’t mean the bad doesn’t happen, and vice versa. Watch out. The financial aspects – especially in America – add a layer of far more complication, with a large amount of utter insanity mixed in … and sometimes outright corruption, making it very hard for healthcare to achieve its potential in saving lives or keeping people healthy. When patients asked me, “Doctor, can you save me?” usually I would answer, truthfully, “Probably not,” and I would watch the life go out of me. In February at the “friends of Tom” gathering I met Jon Lebkowsky, someone who’s been doing social media since before the Web: he was on the pioneering online forum the WELL, and he really knows how things play out. This was when Twitter was brand new, and people were scoffing at it, saying “Who cares that I had a tuna sandwich for lunch?” But @JonL said what it’ll be good for is finding others and getting found, particularly reaching people with new ideas, people you’d never have been able to reach. I joined Twitter that day, and he was danged right. On election day, November 4, I was in San Francisco for my day job, at the huge DreamForce conference for users of the Salesforce.com CRM system (customer relationship management). 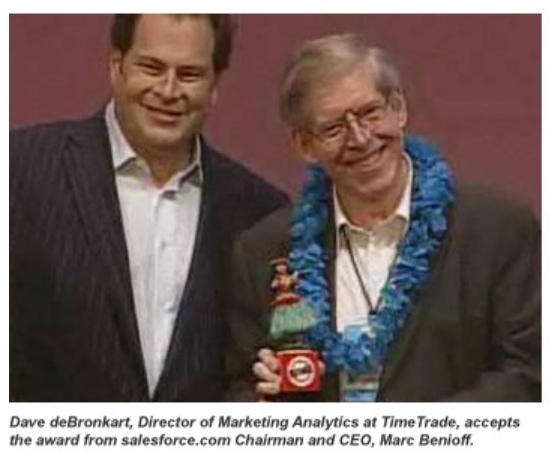 I was the Salesforce admin for my company, and I’d been nominated for the “Appy Award” in marketing excellence. Much to my surprise, I won! The relevance of this will come out in the next post: I was an ordinary but capable user of data and automated workflows. Obama was elected, which soon had many effects on US healthcare (and thus my trajectory). The next morning I got to meet a remarkable doctor whom I’d already known on Twitter: @TedEytan of Kaiser Permanente. He is the embodiment of generosity and caring, and has turned out to be an exemplar of so many “good ways to be.” Here’s his blog post about it, including this photo at DreamForce. In each post I’ll include a running tally of my blog posts, speaking events, significant moments. my blog 105 posts. Previous total 5; total 110. Total: 152 this year, 157 total to date. Speaking events: 2 – Connected Health and then the Irish business development evening. Thank you, Dave. For the comments about ACOR, of course, And equally for journaling what most of us did without ever thinking about the potential significance of our work. I now understand there was nothing obvious about our work then, but I honestly think we were clueless about the truly disruptive potential of our initiatives. I imagine you’re right, Gilles – y’all were just doin’ what you were doin’. I came along and was stunned at what was in Tom’s manifesto, and couldn’t believe we weren’t going around banging on fences. Thanks for the good words, and everything else. I remember that day when I read your post about becoming E-patient Dave. This retrospective is awesome! At that point, I did not yet start reading every book you recommended. That’s amazing and wonderful feedback from you, Ileana. I very well remember your commitment and your assistance, in any way we could figure out. Thank you so much. My intention in this series is to put the whole trajectory in a perspective to help understand how to approach improving the system… feedback from committed people like you is invaluable. Update: working on my 2009 post(s? ), more important 2008 memories came back, so I added a new section with them on this 2008 post. 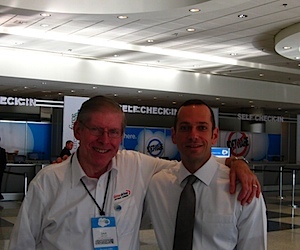 ….and I got to meet a remarkable ePatientDave, just at that moment in my development as an adult that I knew something amazing would find me. Photo taken the day after the most stinging and hurtful rebuke of the LGBTQ community by California voters. Sometimes patients help doctors heal. Sometimes we all help each other heal. You’re an exemplar of bottomless patience, love, and commitment. Oh, and generosity.